Small improvements can make a huge impact when updating your kitchen. If your kitchen has solid bones, all you may need to do are a few changes. The 11 quick fixes below are a surefire way to achieve an upgraded look without extensive renovations! You’d be surprised at how much a fresh coat of paint can transform your cabinets into totally new-looking ones. 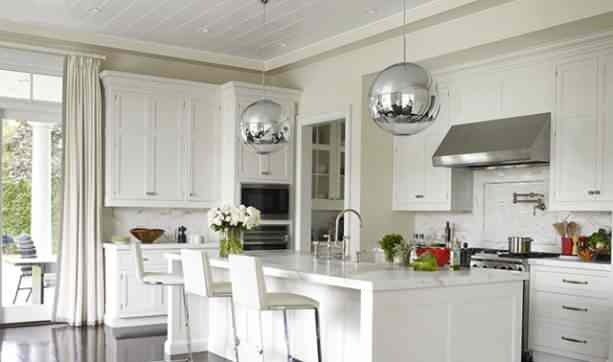 This decorating trick is known to give kitchens a light and airy feel if the proper paint colours are selected. If you’re looking for a quick weekend project that can save you some cash, or if you’re saving up for a big kitchen renovation later, this is for you! Find out which paint colours are best for your kitchen cabinets here. A dated countertop ages a kitchen. Good thing countertops can be easily upgraded! This quick kitchen fix is bound to give your kitchen a new life! A new backsplash might be all your kitchen needs to inject personality into it. A bit of sparkle, texture, or gloss in your backsplash can make your cabinets and counters stand out, giving your kitchen a whole new look and feel. Adding some well thought out details will bring out the beauty of your kitchen. New hardware can instantly give your cabinets a little pick-me-up. The same goes for lighting fixtures. You can either replace your existing lighting or go get one of those magnetized shades to add a surprising wow factor. If you still do not have a detachable spray hose, now is the time to install one. They’re not only pretty but can make washing up so much easier. Spouts with a flexible braided water supply hose are great! This can be accomplished a number of ways. You can build a kitchen island if you don’t have one or introduce a new material as an added counter space to your existing ones. You can choose to add a new bar or perhaps a foldable surface that can double as preparation space or a small table. This may sound a like a little more than a small improvement but replacing your doors and cabinet fronts can give your kitchen a welcome facelift without changing anything else. Open shelving gives you an opportunity to showcase your prized wine and plates collection. They are also great for keeping frequently used items accessible. Never underestimate the power of a nice rug or a beautiful runner. A nice plant or a vase of flowers goes a long way for warming up a kitchen. If your kitchen has some design elements that you are not a fan of, consider showcasing your favourite area or appliance to make what you do not like less noticeable. This kitchen improvement just takes hours! A ready-made freestanding piece can be bought at a home improvement and décor shop and be delivered to your home on the same day. Go for a kitchen island with extra storage and a top that matches your existing kitchen’s countertops. Want to take this even further? You can replace the top of an existing freestanding piece. This way, you can opt for a new surface or even go for a larger one to expand your counter area at the same time! Home shopping in Toronto? Where better else to start than Oakville? Oakville has a neighbourhood for every lifestyle and needs. Contact us and let us help you out in finding your dream Oakville luxury home!